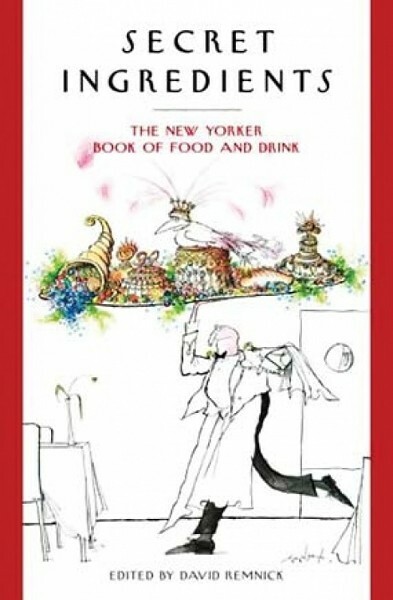 For more than 80 years, The New Yorker has been the go-to magazine for this country’s best fiction, essays, reviews, poetry, commentary, criticism, cartoons and, occasionally, writing about food and drink. So it shouldn’t be any surprise that the best book dealing with food, wine and spirits I’ve read this year would be Secret Ingredients: The New Yorker Book of Food and Drink. And there isn’t a single restaurant review in its entire 583 pages. Well, no restaurant reviews per se. There are in Secret Ingredients many vivid scenes set in restaurants large and small, as in Jim Harrison’s “A Really Big Lunch,” in which he recounts a 37-course lunch he shared with 11 other diners at Marc Meneau’s L’Espérance, in Burgundy, France. Or you can read with envy “The Afterglow,” about A.J. Liebling’s memorable meals taken in Parisian cafes long gone. Cuban cuisine and nostalgia in Havana and Miami is explored in Susan Orlean’s essay “The Homesick Restaurant,” about Cubans’ quest for childhood dishes like caldo Gallego and zarzuela de mariscos. And Calvin Trillin’s rib-tickling “An Attempt to Compile a Short History of the Buffalo Chicken Wing” takes readers to Buffalo, N.Y., as well as New York City hotspots like the Anchor Bar, Wings N Things and Bird Land in search of the original Buffalo chicken wing. But none of the Secret Ingredient essays are reviews. Rather, they are celebrations of food and drink by people who really know how to celebrate food and drink and how to write about them. Among them: M.F.K. Fisher, Dorothy Parker, Woody Allen, Steve Martin, John Cheever, Louise Erdrich, Don DeLillo, Ogden Nash, Anthony Bourdain, John McPhee, Nora Ephron and Alice McDermott—and that’s just a smattering of the 50 or so gifted writers featured in Secret Ingredients. For much of my post-adolescent life, I’ve fantasized about rubbing elbows with Dorothy Parker at the Algonquin—that is, until I read her gut-busting piece in Secret Ingredients entitled “But the One on the Right—,” in which she lacerates the dining companion seated beside her for his absence of wit, conversational creativity and interesting opinions. It’s very funny stuff, every bit as brutal as Hunter S. Thompson at his savage best. Equally uproarious is S.J. Perelman’s “Nesselrode to Jeopardy,” a send-up of international intrigue in which a French chef named Moustique—who’s been poisoning customers with his hollandaise—leads his pursuers (including a New York City health inspector) to Turkey and beyond amid hilarious clichés and contretemps. New Yorker Editor David Remnick is the best in the biz to begin with. But in Secret Ingredients, he really pulls off a masterful job—first, in selecting the cream of the crop from eight-plus decades of New Yorker articles; and second, in artfully arranging them into an eight-course buffet, portioned into sections like “Dining Out,” “Eating In,” “Fishing and Foraging,” “The Pour,” “Tastes Funny,” and “Small Plates.” There must have been dozens of great pieces that he couldn’t fit into Secret Ingredients: I eagerly await Volume 2. What I love so much about this book is its generous expansiveness. The articles in it span the past eight decades, from Dorothy Parker’s 1929 piece up to Jim Harrison’s “A Really Big Lunch,” first published in The New Yorker in 2006. In Secret Ingredients, the reader also journeys from restaurants in Paris, Tepotzotlán, Havana, Guangdong and Long Island to kitchens in Kyoto, Umbria, Rio, Frankfurt, Dijon, Seoul and beyond. And then there are the characters. Remember Seinfeld’s “Soup Nazi”? He’s here, in “Slave,” Alex Prud’homme’s piece about Armenian restaurateur Albert Yeganeh, on whom the Seinfeld episode was based. If, like me, you are weary of the Food Network and celebrity chefs and are looking for something truly juicy to bite into, it just doesn’t get any more delectable than Secret Ingredients.